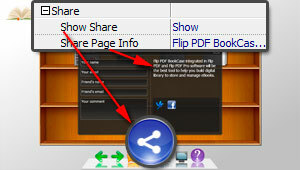 Flip PPT BookCase integrated in Flip PPT Pro will be the best tool to help you build digital library to store and manage eBooks. 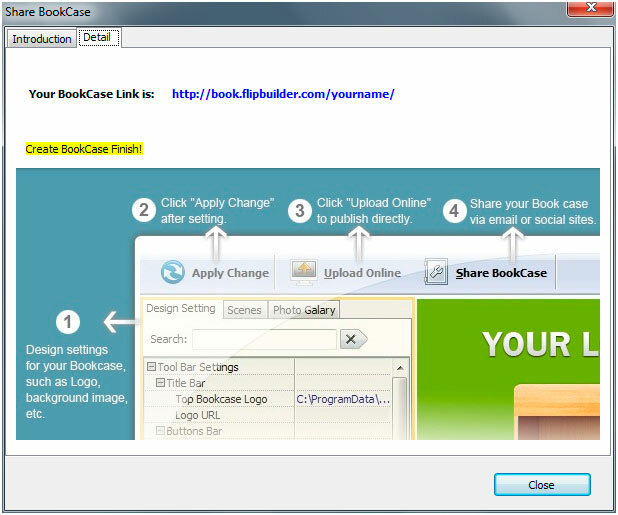 All books you published on FlipBuilder Server can be collected and shown in your bookcase automatically, you can easy manage and share the books via using the wonderful and realistic BookCase tool. ii. 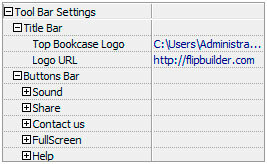 If you have built account in FlipBuilder Server, just login with your Email and Password, click "Login". You can set Tool Bar Settings, Book Settings and BookCase Display Settings. You can also use Scenes to be the background of your BookCase, or build Photo Gallery for your BookCase. 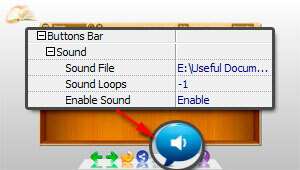 You can set background sound for your BookCase, choose MP3 file, and set Sound Loops ("-1" stands for playing the sound file all the time while viewing BookCase), check "Enable" at last. 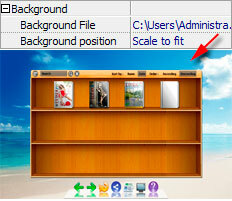 Enable your BookCase viewers easy know more info about your company and contact you with simple clicks, just input your information in "Contact Us" setting options, like Company Picture, Company Description, Company Name, Company Address, Company Website, Email, Skype, Yahoo, et..
Book Space: You can set "Book Space" value to define the distance of two books on your BookCase, the max value is 1, the min value is 0.25. 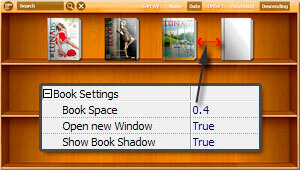 Open new Window: Set "Open new Window" as "True", then when viewers visit your BookCase online, they can open your book in a new window instead of opening in the current window. 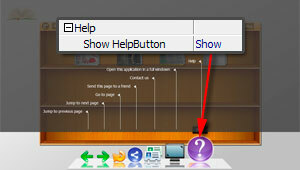 Show Book Shadow: You can also set "Show Book Shadow" as "True" to make your BookCase look more realistic. 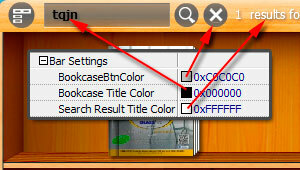 You can set BookCase Button Color, Title Color and Search Result Title Color. Viewers can search book while viewing, and you can set the least number of search characters. You can set the shadow of your BookCase show or not. Define background for your flipbook with gradient color or pure color (the same color for "Gradient Color A" and "Gradient Color B"). Gradient Angle is the angle between two colors. 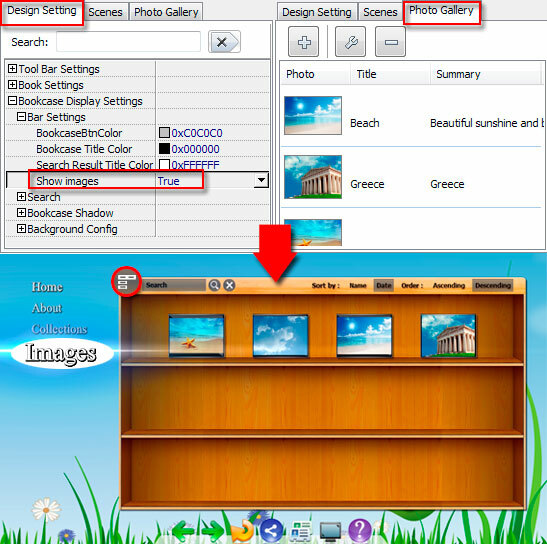 Click the icon " " to choose background image from your computer, and there are 11 kinds of "Image Position" for you to choose: Scale to fit, Fill, Top Left, Top Center, Top Right, Middle Left, Middle Center, Middle Right, Bottom Left, Bottom Center and Bottom Right. 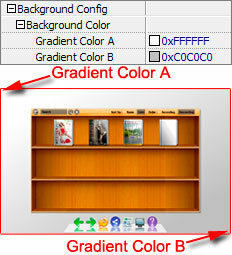 Set the value (0-1) of alpha to control the transparence of the background of BookCase. For example, you can set the value as 0 to make the BookCase background as transparent completely, when you embed the BookCase in other HTML page, it will show background of that HTML only. 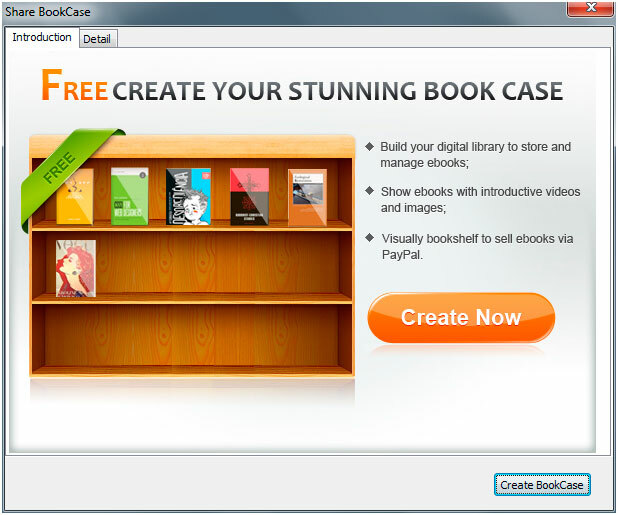 To make your BookCase more attractive and lively, you can apply animated background which called "Scene" in the BookCase setting interface. There are many pre-designed scenes for you to choose and use directly, such as Autumn Leaves, Beach Beauty, Desert, Moon, Underwater World, Grassland, Snow, Clouds, etc. Double-click to apply the scenes, or you can set your own style scene by setting "SWF" format background image in "Design Setting" part. 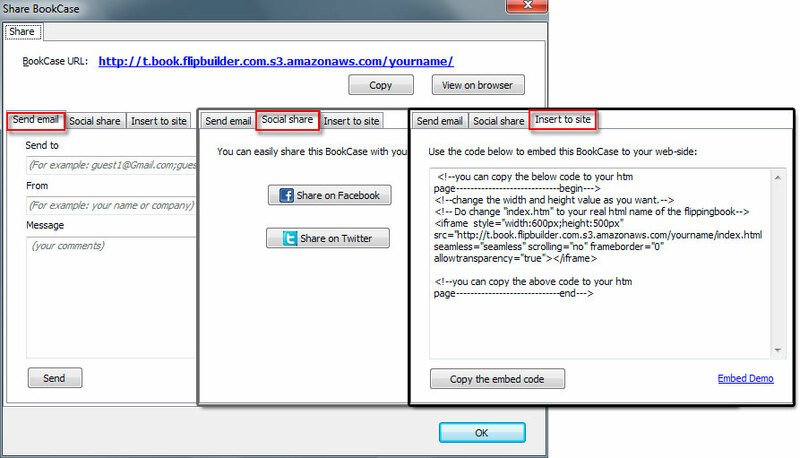 After uploading successfully, you can click "Share" to share your BookCase with others via email, or through social share websites, or copy the Embed Code to insert into other webpages.